Be Indignant! This is the call to action from a veteran of the World War II French Resistance. This is not a voice coming to us from the past but the current voice of a now still-feisty 93-year-old writing less than a year ago. It is rare to hear something so up-to-date and relevant from a man of such age – often such people are still stuck in the past, a time when they were actively involved in a righteous struggle. Stéphane Hessel was active in the French Resistance in the 1940s and was attached to de Gaulle’s government-in-exile. He escaped from the Nazis a number of times, including the day before he was due to be hanged. In 1948 he was one of twelve people involved in the drafting of the UN Universal Declaration of Human Rights, along with such people as Eleanor Roosevelt. He was appointed French ambassador to the UN in Geneva in 1977 and holds a life-long diplomatic passport, which he still uses to visit places like Palestine, to see first-hand what is happening there. 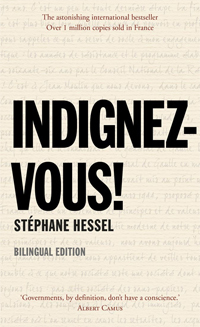 Hessel’s short (less than 18 pages) call references contemporary political and social situations and implores especially young people to be indignant about government excesses and dishonesty, the erosion of rights and freedoms and the atrocities perpetrated by States such as Israël. He calls for expression of outrage at injustices, wherever they occur. In Australia we are witness to injustice on a continual basis, against Aborigines, poor people, asylum seekers, people who are perceived as different and those who don’t fit in. More than sixty years after the overthrow of the fascists in Europe, we do not seem to have progressed very far. This is what angers Hessel and has him call us to (non-violent) action. While not condoning violence, he is nevertheless understanding of its roots for those people who live in despair because of the actions (and inactions) of many governments. Scribe Publishing has made this not just a compelling publication with this translation by Damion Searls, but has made it fascinating by including Hessel’s original French treatise, as well as an Afterword (in English) by this edition’s editor, Sylvie Crossman, which sets an historical context for Hessel and shows that he has always been fearlessly willing to voice unpopular opinions. The inclusion of the original French text would make this a very useful work for students of French. The translation is excellent, yet there is added pleasure to be had from the cadences and rhythms of the original. Even though my French is no longer good, I thoroughly enjoyed reading the original. The whole English text can be read in under an hour and benefits from re-reading to appreciate the real power of what the author is saying. His call is not to oppose elected governments, but to hold them to account and to insist that they honour the rights embodied in the Universal Declaration of Human Rights and that they not try to define them out of existence, as George W Bush and others have attempted to do. Stéphane Hessel sounds urgent in his call and he should be – we are witnessing a continual erosion of many things that make our enjoyment of life possible and we need people such as Hessel to keep pricking us to stay awake.